Q: Harkening back to those mid-’90’s, what stands out to you about those athletes? KZ: There were a lot of great players in those years, those were some of our best years. And you look at some of those rosters: you have Barron Miles, a pretty small guy at cornerback who to this day is still playing/coaching up in Canada. Some of these guys were just high achievers in everything they did. I guess what I learned in working with all those guys was to never underestimate them, no matter what their status was athletically, and respect the unity and support you saw within the team, the chemistry. It didn’t seem to matter if a guy seldom played or was a high-profile guy, there was a brotherhood among all those teams. You still see that today: they stay in contact, they’re supportive and have ongoing relationships. That’s one thing when you talk to all these former athletes, when you talk to them it’s ‘relationships’. You hear that word come up over and over again. Those special relationships that were formed came about because of athletics. The lifelong relationships, that’s what we were able to play a part in. It’s a lot of fun. Q: Plus an awesome responsibility, yes? In the recruiting process when you have a coach in the living room telling them that Nebraska is going to give their son a quality education, you’re where the rubber meets the road as far as that’s concerned, no? KZ: Ultimately, the student-athlete has to do the work. We’re more like an offensive or defensive coordinator, we try to put the athletes in the right position and give them good advice; but obviously there’s a lot of scrutiny, a lot of integrity, a lot of compliance. The student has to do the work, they earn the degree; we just direct them and navigate them and encourage them along the way. The college graduation, as you remember for yourself, that’s the crowning moment. Some of these young men maybe didn’t think that was possible when they came here. But when that day comes and they walk across the stage, that’s like the national championship. KZ: That very well could be, because athletics came a little easier for them. They may not have seen graduation as something that could or would happen, so I can see where a lot of them say that. It’s just a life-changing moment that opens a lot of doors and opportunities for them, which they’re going to need for the next 35-40 years of their lives. Maybe they underestimate it on the way in, but as their college experience unfolds and maybe nothing happens athletically, -injuries, playing time, whatever that may be- I think eventually they all start seeing the significance of a college diploma. Q: I suppose you keep in touch with a lot of those guys over the years? KZ: You know, I talk to a lot of them. And a lot of them call me if they’re going through a career change or need some advice on a number of things, and that’s a proud moment when those former athletes still have a lot of confidence, 15 years later, and call you and ask you for some direction and some support. I think that’s what makes Nebraska special, because when your playing days are over Nebraska doesn’t just discard you and move on to the next group, but tries to maintain that relationship and pledges that ongoing support forever. I think that’s why there is such long-term affection for the University of Nebraska among former athletes: not just football, but all of them. And whether it‘s me in Life Skills, or Dennis LeBlanc in Academics, or the trainers like Doak Ostergard or the strength coaches, I think that’s really everybody’s approach and philosophy. That’s the way it should be, you just don’t start to forget about these people once they’re done winning the national championships for you, but use their expertise to benefit the program, and that’s what we’re trying to do. Q: Any memorable experiences with coaches or staff members of that time? KZ: They were really all memorable, growing up as a kid like you, you’re a fan of the Nebraska program, to think that 10-15 years later you’re sitting in a meeting with Tom Osborne or Bob Devaney. Those first few times interacting with those people, that was a little different, you’re in awe. But later, after a while, you understand you all have the same goal to develop student athletes and be successful on and off the field. Just to play a part in that with all the coaches and the support staff, you start to not really pay attention to who you’re interacting with, but who you’re dealing with in the shared vision of what we’re trying to accomplish. So at the beginning it’s little awe inspiring, but after awhile you tend to forget you’re working with some of these legendary figures and you start to look at them as co-workers who have the same goals and vision in mind for the program. Q: Speaking of the goal and vision, do you recall Coach Osborne setting out a road map, working on creating a vision? KZ: I think the big thing that Dennis and myself tried to do (which came from Coach Osborne), was to make sure that everybody you deal with be treated equally. It didn’t matter if you were the starting player or low-impact player who maybe didn’t contribute for three or four years, the important thing was to be attentive to every student, every person. And that was kind of the philosophy of Coach Osborne, how the Nebraska program has flourished, with the walk-on program and tradition and treating everybody well. 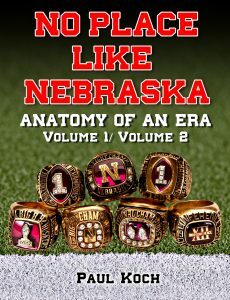 You don’t really hear a lot of disgruntled athletes coming out of the Nebraska program because of the way they were treated. That’s something -still to this day- you make time for everybody. What matters is their effort and their goals and how you can help them achieve them. Q: Speaking of, any stories close to your heart about your ability to play a big part in someone’s life? KZ: Well, one guy who had a lot of impact on me was Brook Berringer. He was very community-minded -and obviously, the tragedy when he died in the plane crash- Brook was a guy who did a lot for the entire state. And I have always been the guy who’s done a lot of community programs with the athletes and coordinated a lot of the outreach efforts, so it’s been kind of exciting to see the impact from the efforts of Brook and the people like Will Shields. Those guys created such a legacy that I still try to carry on with the present players. We have the Berringer Citizenship Award to honor players who do a great job in the community every year, so it’s been great to be a part in some of these guys’ lives, so they can emulate and encourage other players to model the positive actions of those guys that have gone before them. Brook’s mom, too, she’s still is very involved here at the University. Some people just looked at him as the ultimate team player who was a great quarterback when we had one of the nation’s best quarterbacks, so I think a lot of people tend to overlook how gifted he was athletically and how he had a great chance to play in the NFL. But he was the complete person, great student, very community-minded. And that’s why, when he passed tragically, it really shook the entire state. People felt like they knew Brook Berringer because he was such a physical guy, not just on the field, but in the community and the schools in outreach programs across the state. You’d see the memorials outside the stadium for weeks afterwards, and to this day there is the statue of him and Coach Osborne outside the stadium. Here we are over 14- 15 years after his death and he’s still a prominent person in a lot of people’s lives. Q: Last questions, Keith. Any unique constraints, from your perspective, that made things more difficult for the players? KZ: Honestly, whether they play softball or tennis for football or golf, I wouldn’t say they have any constraints within their sport. One of the things I try to teach all of them is the value of athletics, of how you can take those transferable qualities that you develop day after day, month after month, year after year for sports, and how those can benefit you in life to leadership, to teamwork, to being competitive, to being driven, to perform under pressure -no matter what their sport- to apply it to life, because it gives them a huge advantage. And as their career unfolds, it helps them to apply those things and be very successful well into the future. Q: Ties it all together, Keith? Q: So where did you gain the skills to build the Life Skills segment? KZ: Well, a lot of it is just the counseling skills and how you work with people and how you treat people. I was taught that with my undergrad and graduate educational work. I also had a position before I did my graduate work, Paul, where I worked in social work for the Department of Social Services when I was fairly young. I did some abuse investigations, worked with at-risk children, a lot of different families and parents. And through those positions and through the education, the big thing that I learned was how to work with people, how to listen to people, counsel people, direct them, advise them, how to follow up with them. Really, that’s at the heart of what I do. If you pay attention to people, if you work consistently with people, if you are there for them day after day, if you pledge your support to them, usually they engage with you and they appreciate that, and they will work hard for you. And ultimately people are succeeding and achieving their goals. In all honesty, there’s nothing sophisticated to what I do. It’s just those core values of being consistent, paying attention, listening, working hard, and I think that’s the way a lot of Nebraskans work. A lot of Nebraskans in the state and a lot of people in the athletic department do that, and the student athletes and their families then begin to perceive you in a pretty positive light. From our brief conversation one can sense a measure of virtue and servanthood in the man, don’t you think? He’s one of those folks who never ever forgets what the Nebraska football team means to its fan base, and in many respects you could say that Keith still is a fan of the boys in scarlet & cream, only now he’s in a position to shape and form and mold them to some extent. What a fulfilling vocation. I’d never heard it phrased that way before, but his statement rings true: “When your playing days are over, Nebraska doesn’t just discard you and move on to the next group, but tries to maintain that relationship and pledges that ongoing support forever.” So true. Even for the boys from back in the ’90’s, they know to this day that they can call Keith for some direction, insight, or work connections and have his full dedication and attention. That’s pretty rare, and quite frankly goes against human nature. I know why Coach Osborne would want to create a position for Keith Zimmer, because he was of like mind. And that’s a good man to have around.